Five species of Marine Turtle come to land on African beaches to lay their eggs: Green (Chelonia mydas), Hawksbill (Eretmochelys imbricate), Olive Ridley (Lepidochelys olivacea), Leatherback (Dermochelys coriacea) and loggerhead (Caretta caretta). There are seven species of marine turtle. Six are classified as endangered or critically endangered. Turtles are found in most of the world’s oceans, apart from the polar regions. Five species come to land on African beaches to lay their eggs: Green (Chelonia mydas), Hawksbill (Eretmochelys imbricate), Olive Ridley (Lepidochelys olivacea), Leatherback (Dermochelys coriacea) and loggerhead (Caretta caretta). Found in continental shelf waters. Males do not leave the sea. Females return to land to lay their eggs on sandy beaches – the same beach they hatched on. They can swim thousands of kilometres between feeding and nesting grounds. Most marine turtles are carnivorous, feeding on marine invertebrates, molluscs or crustaceans. The green turtle however is herbivorous. Its diet consists mainly of seagrass and algae. The main threats that affect marine turtles are habitat loss and degradation, wildlife trade, collection of eggs and meat, accidental capture, pollution and coastal development. 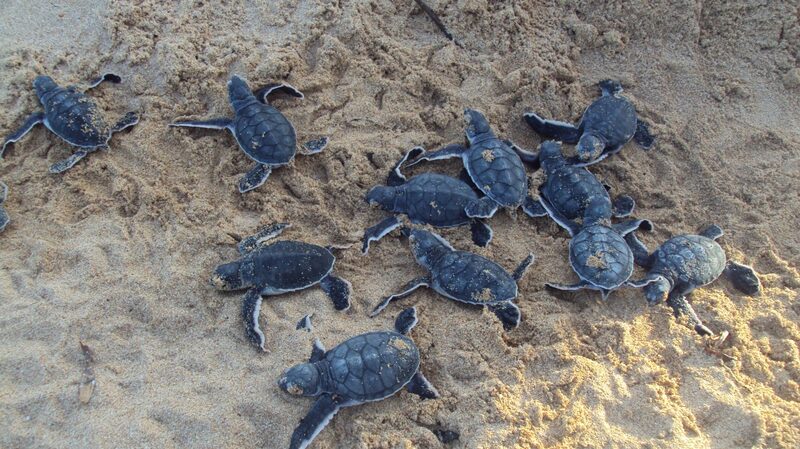 Conservation measures are aimed at protecting turtles and their offspring by aiming to reduce bycatch and illegal trade, and through habitat protection. Tusk supports several marine conservation initiatives which run community-led projects to manage marine areas and rescue turtles that have been accidentally caught by fishermen.